Grease Kuih Bahulu mould, preheat the oven together with the mould at 200°C. Mix baking powder and flour in a bowl, set aside for later use. Beat eggs and sugar with electric beater until pale, thick and fluffy. Turn to low speed, gently add flour in 2–3 batches into eggs and sugar mixture. Do not over-mix. Remove mould from oven, fill with batter up to surface-level. Bake in preheated oven at 200°C for 12–15 minutes or until golden brown. Remove bahulu from the mould and cool on wire racks. Grease and reheat the mould in the oven for 2 minutes. Repeat baking until all the mixture finished. 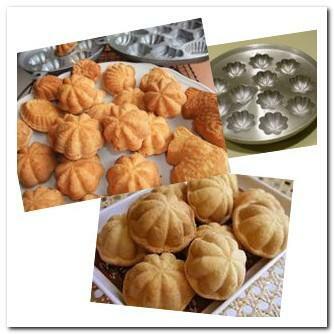 “Bahulu – Mini sponge cakes” made from a mixture of egg, sugar and flour. Kuih Bahulu is light and fluffy and tastes slightly dry. It is baked using a special mould with charcoal fire. You have to place the hot coals on top of and under the mould. But nowadays, people prefer to use electrical ovens as they are a lot more convenient and time saving.